The Red-Spotted Bluethroat or Luscinia svecica is a small passerine bird which is similar in size to the european Robin. The male has a blue bib with a red spot in the centre. I got this shot at Thol lake. I was only about 2 -3 feet away from this little bird. I took it with my Canon 450d. I was in a really awkward position when I took the shot. I was following it around trying to get a good picture and as I was getting close it flew away. It then started coming back towards me slowly. I didn't want to move incase I scared it away again. I had to stay still and calm but I was pointing the wrong way to get the shot comfortably. I've never seen a bird like this ever, it so caught my attention..very lovely shot, I'm sure it was worth every sore muscle..thankyou for sharing your picture. 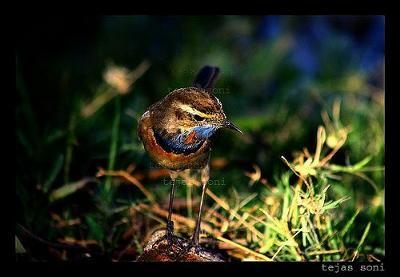 Thanks Tejas, I love this shot of the Male Bluethroat. I can see it's lovely blue breast with the red spot in the middle of it. I believe it's quite a rare bird. Well done for getting such a good picture of it. I am quite excited and pleased to tell you that because of all the great nature and wildlife shots that I'm receiving, I've started a new section called 'Wildlife Photos'. Keep up the good work and keep them coming. Everyone loves nature!